The blacklist is one of the most pernicious tools in the employers’ armoury. In 2009, its widespread use in the building industry was highlighted by the Information Commissioner’s Office. However, what has also come to light is the collusion of trade union officials in its operation. The article below, revealing the activities of these officials, is from the latest issue of the rank and file Site Worker paper. More evidence of their betrayals will probably come to light. It may take longer though for information about the third arm of the offensive against trade union activists to surface – the actions of the state. 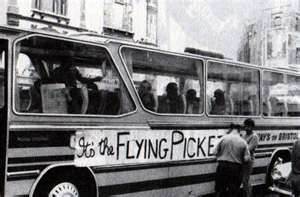 For, ever since the 1972 Building Workers Strike, which led to the jailing of the Shrewsbury Pickets, the state has been determined to ensure that no such challenge should arise again – and the employers and trade union officialdom have been central to their plans. When it came to light, after the Information Commissioner’s Office exposed the Consulting Association’s (CA) construction blacklist in 2009, that some Unite and UCATT officials had allegedly been supplying information about rank and file union members directly to the CA, a new trade union low had been reached. Union officials are supposed to safeguard and protect rank and file union members from the worst excesses and practices of industrial corporations and the bosses who own and run them. Yet here we had union officials actually colluding with a secret employers’ blacklist in the building industry. Trade unionists in the construction industry were denied the right to work, earn a living and to make sites safe. This resulted in dreadful economic and social consequences for them and their families. There can be no greater breach of trade union trust or act of betrayal than this. When this is confirmed, then these collaborators should be publicly named and shamed and driven out of the trade union movement for life. Instead Unite and UCATT are disgustingly and disgracefully trying to cover up the conduct of these officials and to sweep this under the carpet. It has been reported that, in 2006, the then General Secretary of Unite, Derek Simpson may well have known about the CA and its activities yet did not act. Why? The conduct of these officials is so vile and treacherous that the issue will not go away. The names of more and more officials will be revealed in court as more and more unredacted files (i.e. without names blacked out) are obtained by lawyers representing some of the workers blacklisted by the CA in high court cases. The pressure for Unite and UCATT to finance enquiries about all aspects of the CA scandal, including collusion and also the dreadful performances of union legal firms will continue to increase. To have any credibility these will have to be done by independent legal experts and blacklisted members must also have a say in this. We say to UCATT General Secretary, Murphy, and Unite General Secretary, McCluskey, there will be no hiding place. Eventually the whole truth will come. If UCATT and Unite do not take a lead in a forensic search for the whole truth they will suffer the fate they deserve – which will be to be held in contempt by their own members and sire workers in general. Collusion and cover up must end, truth and democracy must flourish.